The JM Internet is a publisher of books on key technology topics. The company is announcing a review program for The Password Book, a book for the general public on passwords and internet security. ​​The JM Internet Group, a leader in online internet marketing training in SEO, AdWords, and Social Media Marketing, is excited to announce that the company's latest book, The Password Book, is now available via a zero cost review program. Persons interested in obtaining a zero cost copy can apply to the review program on the company website. "Nothing in the realm of technology seems more timely than Internet passwords, scams, and security," explained Jason McDonald, Director of the JM Internet Group. "For this reason, we have limited funds available to literally give away The Password Book to interested readers. It's written for the average person in plain English and is a way to upgrade one's passwords, understand scams, and audit the Internet security of one's bank account, email, and other targets for Internet scammers." 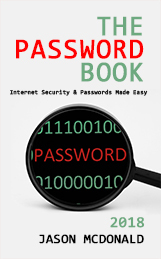 To learn more about The Password Book visit https://www.amazon.com/Password-Book-Internet-Security-Passwords/dp/1975999150. To learn about the zero cost review program, visit https://www.jm-seo.org/books/password-book. Review copies are available in both print and Kindle. It should be noted that while this is a "review program," participants are encouraged but not required to write a review of the book. At both locations, interested persons can view excerpts from the book, see the table of content, and learn how and why The Password Book is a small but important book that everyone who worries about password and Internet security should have. Here is more background on The Password Book. While most password books (or password organizers or password journals) are just places to write down websites and passwords, The Password Book covers three important and interrelated topics. First, the book educates readers about what scams are out there and how they work. A little scam education goes a long way towards bolstering one's resilience against being scammed. Second, the book helps the reader go step-by-step through his or her key accounts, especially email and bank accounts, that are prime targets for thieves. And, third, the book provides a password system to create easy-to-remember yet hard-to-guess passwords for online accounts. The JM Internet Group provides SEO, Social Media Marketing, and Google AdWords training and courses for busy marketers and businesspeople. Online search engine optimization training helps explain keywords, page tags, link building strategies and other techniques needed to climb to the top of search engine rankings for Google, Yahoo, and Bing. The teaching methodology is hands on, with live examples and discussions, taught from the convenience of each student's computer. It should be noted that the company maintains important book lists such as its list of the best SEO books at https://www.jm-seo.org/2015/05/best-seo-books and the best social media marketing books at https://www.jm-seo.org/2017/01/social-media-marketing-books-2017-list-best-books-social-media-marketers.